Katayama Yoshitaro became a police detective after having followed the will of his father who had been known as a great detective. However, Yoshitaro can never step into murder scenes because he faints whenever he sees blood, and criminals are able to easily slip away because he is afraid of heights. He also has phobias of women and ghosts. Moreover, he hates to doubt people more than anything, so he happens to believe whatever people say. Thus, Yoshitaro has tried, in vain, to quit his job a number of times in the past, but his brother Hiroshi, who loves mystery novels, and his super active sister Harumi always manage to convince him to remain as a detective. One day, hopeless Yoshitaro finds a calico cat that somehow understands what people say and sometimes shows great reasoning power. 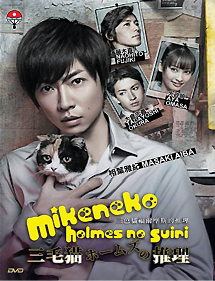 With the help of strange hints given by this cat, Yoshitaro luckily succeeds in solving the cases.